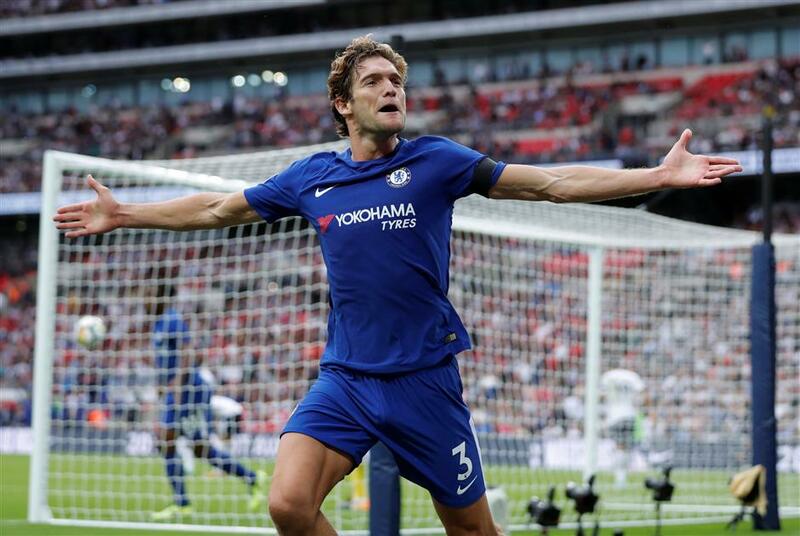 Two goals from Marcos Alonso gave Chelsea a 2-1 victory over Tottenham Hotspur on Sunday in the first-ever English Premier League game at Wembley Stadium. Chelsea's Marcos Alonso celebrates scoring his and his team's second goal, which was the winner, against Tottenham Hotspur during their English Premier League game at Wembley Stadium in London on August 20, 2017. Chelsea won 2-1. Marcos Alonso's double reignited Chelsea's title defense by securing a 2-1 victory over Tottenham Hotspur on Sunday after goalkeeper Hugo Lloris blundered to enable the English Premier League champion to recover from its opening weekend loss. Tottenham had been well placed to salvage a draw when Alonso's first-half free kick was canceled out by Chelsea striker Michy Batshuayi inadvertently heading the ball into his own net in the 82nd minute just after coming off the bench. But within six minutes Chelsea was back in front and Batshuayi's blushes were spared. Lloris threw the ball out to Victor Wanyama and Pedro Rodriguez disposed the Tottenham midfielder. The ball was then thread through for Alonso, whose shot squirmed under the normally reliable Lloris in the Tottenham goal. Last season's top two now have a win apiece after Tottenham opened the season with a victory over Newcastle United last Sunday. Chelsea was left demoralized after it opened its title defense by losing at home to Burnley. For all the noise and wall of flags that greeted their arrival, Spurs needed an early goal to feel at ease in their surroundings. It was Chelsea, however, who made the breakthrough against the run of play on 23 minutes when Alonso thumped home a superb free kick from 20 meters after Dele Alli had fouled David Luiz. The shock jolted Spurs, who spent much of the game peppering Chelsea's goal with Harry Kane hitting the post and Christian Eriksen also going close. Earlier, Huddersfield Town made it two wins out of two at the start of its first EPL season by beating Newcastle 1-0, condemning its fellow promoted team to a second successive loss. Australia midfielder Aaron Mooy scored in the 50th, curling in a shot from 18 meters following a one-two with Elias Kachunga to secure the victory for David Wagner's team. "The boss has a saying to have no limits and we all stand behind that," Mooy told British broadcaster Sky Sports. "It has been a great start so far, but we can't get carried away, it's early in the season. We just have to keep working hard and keep trying to improve." It was Huddersfield's first top-flight game at home since 1972 — 20 years before the formation of the EPL. Huddersfield opened the season by beating Crystal Palace 3-0 last weekend. "People wrote us off last week at Palace but we couldn't rest on our laurels and we have made a statement," forward Tom Ince said. "The manager has come and said it, we are not here just to be part of the league, we are here to show people what we are about and that we deserve to be in the Premier League. "Today was about winning. Two games, six points and we move on." On Saturday, it was: Bournemouth 0, Watford 2; Burnley 0, West Bromwich Albion 1; Leicester City 2, Brighton and Hove Albion 0; Liverpool 1, Crystal Palace 0; Southampton 3, West Ham United 2; Stoke City 1, Arsenal 0; and Swansea City 0 Manchester United 4. Manchester United, which has scored four goals in each of its two games, is top of the EPL table on six points, ahead of Huddersfield and West Brom on goal difference.